Have you ever been in the state of mind that made you wonder, what if all the products in the supermarket could talk? What would they say? What would they do? How would they act? Of course not! 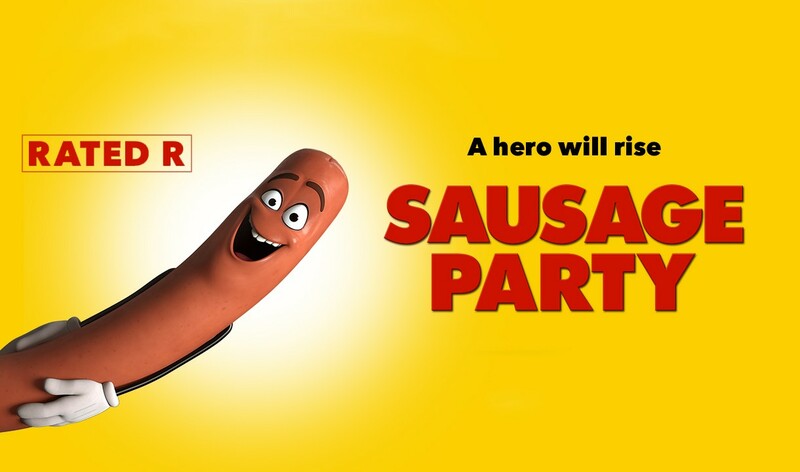 but If so, Sausage Party is the first R-Rated CG animated comedy from the twisted minds of Seth Rogen and Evan Goldberg that answers those pesky questions. The movie is mostly about a misplaced sausage and a few of his friends who embark on an adventure through the aisles of a supermarket in order to return to their rightful places on the shelves to be chosen by customers to be taken to their Godly land. I’d like to be very clear! Sausage Party is a very raunchy animated comedy that is definitely not suitable for children and even some adults. The opening musical sets the tone, with its cursing and Hitler references making sure you’ll know it’ll be an animation like you’ve never seen before in theaters from a major studio. There’s constant use of extreme foul language, with multiple uses of “f–k,” and “s–t,” along with a bunch of graphic sequences of sexual innuendos and non-innuendos performed by the characters that never seem to stop. Additionally, there are some well-crafted riffs on Mexican stereotypes, religious satire, and the historical tensions between races and religions. As you can see Sausage Party makes it a point to touch on every taboo thing possible and this is just the icing on the cake. I can’t really say this movie will be one you will either LOVE! or HATE! but it will for sure make you question your morals and ethics. My wife who is religious, laughed at inappropriate and lewd references and said she felt “dirty” when laughing at most of the humor. I looked over at her a few times and caught her with her mouth and eyes wide open, which added to the humor. At one point I even caught myself with my mouth open in disbelief. I’m still trying to to wrap my head if I like it or not. I mean it’s not the greatest CG animation I’ve seen and the humor is way out there but it is an art medium that makes you question is purpose and your emotions towards it. So with that said make sure you go in a group. I’m sure there will be a topic in the movie that will effect someone at one point or another. I think that whatever stance you have in life, this is a movie you must watch with a group of no less than two so that you can look over and be like “HOLY MOTHER GOOSE! DID THAT JUST HAPPEN”!? because this is surely a conversational piece of work!